A potential single-dose cure for malaria -- a long-sought breakthrough against an illness that the World Health Organization estimates affected 198 million worldwide in 2013 -- is a step closer to approval. And the key drug in the formula was discovered by a team led by a researcher at UNMC. Medicines for Malaria Venture (MMV) has announced that an independent safety monitoring board (ISMB) has recommended the recruitment of patients aged 2-5 to the ongoing Phase IIb clinical trial of the single-dose antimalarial drug combination. This development is "a vital step," said MMV CEO David Reddy, Ph.D. Young kids are among the primary target population of the medicine. In 2013, the WHO estimates, 437,000 African children died before their fifth birthday due to malaria. Adult patients, and children aged 5-15, have been found to well tolerate the treatment, which combines the new, fully synthetic drug OZ439 with the established antimalarial piperaquine phosphate (PQP) in a single dose. OZ439 was discovered thanks to research led by Jonathan Vennerstrom, Ph.D., professor in the UNMC College of Pharmacy, during an MMV-funded drug discovery project from 2000-10. The UNMC team, including Yuxiang Dong, Ph.D., and Xiaofang Wang, Ph.D., collaborated with researchers from Australia's Monash University and the Swiss Tropical and Public Health Institute. MMV is a Swiss nonprofit backed heavily by the Bill and Melinda Gates Foundation. 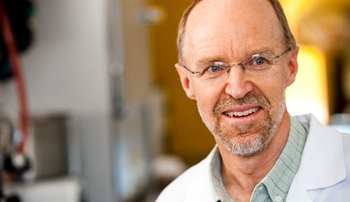 A pioneer on a previous, multi-dose antimalarial, Dr. Vennerstrom said the new combination's single-dose nature would be "a significant advance." People forget. Or they stop taking their medicine when they feel better. This can lead to relapses and drug-resistant strains, Dr. Vennerstrom said. "A single-dose cure would improve patient compliance considerably and would be a huge step forward for malaria treatment and its ultimate eradication," said Peter Kremsner, M.D., scientific director of the Albert Schweitzer Hospital in Gabon, one of the trial sites. The trial will continue at 10 sites in eight countries in Africa, Asia and South America. If well-tolerated by these children, the next group tested would be infants from 6 months to 2 years, another especially vulnerable and hard-hit population. Though it continues to make headlines whenever another clinical trial milestone is met, Dr. Vennerstrom's contribution to the project -- the drug discovery -- is long over. He watches for updates like the rest of us. The work he does, "It's passed on," he once said, "like a baton." He's heartened to hear that it has gone from the lab, to the clinic, to those who need it most.